We open our inbox, and the too-familiar feeling of dread consumes us as bold subject lines inundate the screen. We don't even want to look at the number in parentheses next to "Inbox." According to Radicati's Email Statistics Report, business professionals sent and received an average of 126 emails per day in 2017. And that number is only increasing. With this incessant stream of emails flooding our inbox, it's hard to stay sane, let alone productive. We can barely fathom the day when our inbox is clean -- when we have zero unread emails. Customer support reps and customer success managers work with a lot of customers on any given day -- which means they're receiving a lot of emails, too. So we've compiled four distinct strategies for email inbox organization -- so you can choose which works best for you, implement it, and get back to the work you love, instead of wasting time (and mental energy) wrangling your unread messages. Inbox zero is the process of labeling, triaging, and organizing your email inbox with a system that allows you to reach and maintain zero unread emails awaiting reply in your inbox. Next, let's dig into the rules of inbox zero email management. 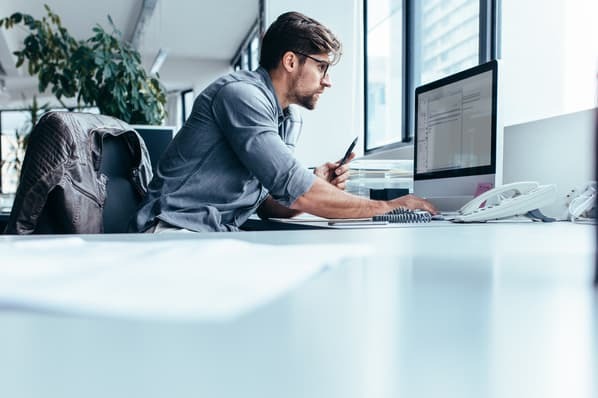 There are lots of approaches to achieving inbox zero, all of which focus on email organization and inbox management from creating multiple inboxes to using labels or filters. The problem is that it's hard to find the right method to achieving inbox zero when everyone has such different email habits and characteristics. What if you just want the best approach for you? 1. Not all emails are created equal. As with most things, the Pareto Principle holds true here: 20% of our emails will consume 80% of our focus. Don't fight it. Welcome that handful of emails and quickly handle the remaining 80%. 2. Our time is precious. Accept it: We won't be able to read and take action on every single email we receive. The input will always exceed the output. But that's okay. The sooner we acknowledge that we can't do everything, the sooner we'll be able to concentrate on what matters at the right time, and finish the rest later. We're sending an email -- not an essay, a thesis paper, or a book. One-line emails are okay, 10 paragraph emails are not. Bullets are great. Big blocks of text which require me to scour the nightstand for my reading glasses are not. Guilt, anxiety, whichever emotion floods us when we open our inbox, we must cut loose. Everyone feels overwhelmed. We can't concern ourselves with feeling, though, we must focus on the doing. Before we can really nail "inbox zero," we have to be honest with ourselves about our priorities and set realistic time expectations. We all have a gut instinct about which emails deserve a response and which deserve a delete -- it can be hard, but learning when to say no is crucial in achieving inbox zero. Now, let's check out how any type of emailer can achieve inbox zero. The Everyday Emailer is, well, just as they sound -- they handle their inbox simply by replying to messages as they come in. This person is very busy, but hasn't dedicated the time to organize their inbox or learn any email tips and tricks. An organized process for managing emails is the Everyday Emailer's best friend -- based on Merlin Mann's original approach, rooted in the getting things done time-management method. We are constantly inundated with emails -- from customers, employees, managers, advisors, investors, partners, dad, mom, uncle Fred, media, advice columns -- the list goes on and on. Navigating this battlefield of an inbox in the midst of starting a new project or taking care of the kids or delivering on Q3 objectives for the boss can be cumbersome. What does this email mean to me and why do I care? What action, if any, does this email require of me? What's the best way to deal with this email and the action it contains? Action required: For emails that require us to complete a task or follow up. Awaiting response: For emails that we expect important responses to. Delegated: For emails we've delegated to others. Archived: For emails we want out of our inbox without deleting them entirely. All emails should be filed into these four folders, leaving our inbox clear. Now, let's walk through the five actions we should assign to each email in order to move them into these folders. Delete: Is this email relevant to me? This is the hardest action to adopt. We love to hold on to emails. We read and re-read and re-re-read and re-re-re-read them until we finally agree with what our gut first told us when we read the email: Delete it. This roundabout method leaves emails floating meaninglessly in our inboxes, and subsequently, in our minds. It consumes valuable mental space. Delegate: Am I the best person to handle this? Sometimes the best action is to forward an email to be dealt with elsewhere. We can CC ourselves and place the email in a "Delegated" folder to ensure that we check on it later. Respond: Can I respond in two minutes or less? This one's easy: If we can respond in two minutes or less, we should respond and then delete or archive the email. Defer: Will this take longer than two minutes? If an email will take longer than two minutes to respond to or if it requires additional research or a third party, we should defer it. Place it in an "Action Required" folder or on a to-do list and then delete or archive it. Do: Can we complete the task in two minutes? We should act on an email if we can do so within two minutes. For example, if the message requests us to complete a short survey or to RSVP to an event -- just do it. We can save ourselves more time if we complete the task immediately vs. coming back to the action later, re-orienting ourselves to the topic, and then completing the task. 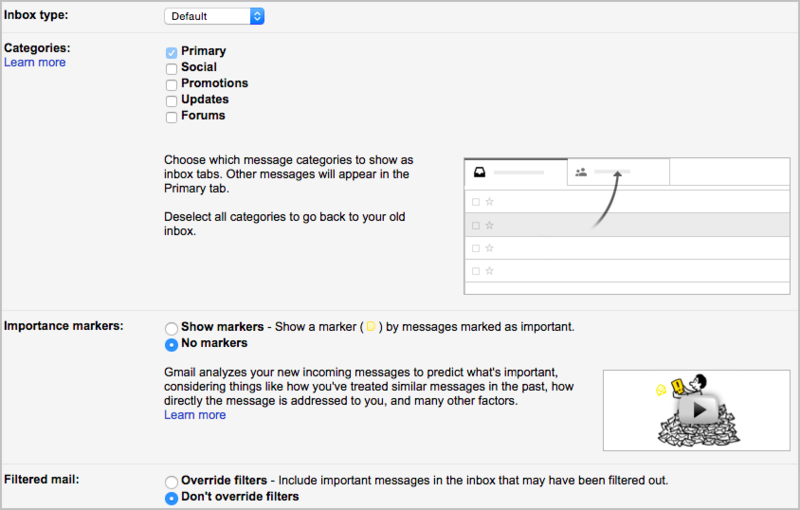 Step 1: Navigate to Gmail "Settings" and go to the "Inbox" tab. 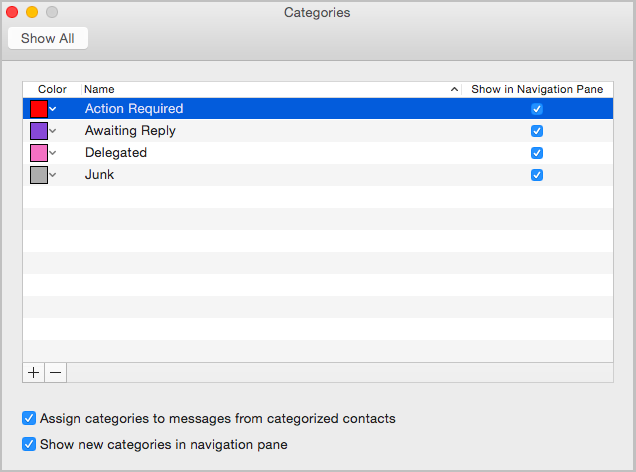 Step 2: Change Inbox Type to "Default," then deselect all tabs except "Primary." Step 3: Go to the "Inbox" Tab in "Settings." Choose "No Markers" and "Don't Override Filters." Now save changes. Step 4: Navigate to "Settings" again and go to the "Labs" tab. Step 5: Search for "Multiple Inboxes" and click "Enable." Step 6: Scroll down under the "Compose" button to "Create New Label." We can create labels for various groups we'd like to categorize our emails into. Keep in mind the four labels we recommend: Action Required, Awaiting Response, Delegated, and Archived. We can color-code labels in our inbox to organize them further. Just select "Label color" when setting up these labels to help you visually present these four inboxes. Step 7: Navigate back to "Settings," and click "Multiple Inboxes," then set the labels for each inbox following this format: "is:label-name." 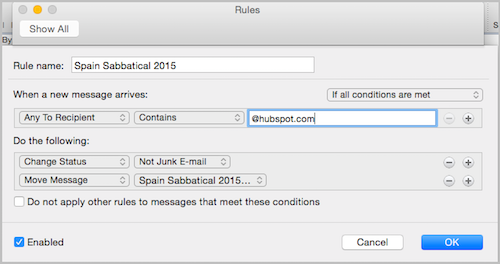 To help handle "Action Required" emails, I schedule email reminders with HubSpot Sales. Instead of writing a to-do list, I schedule emails to arrive in my inbox when I should complete a task so I know I can't ignore it. 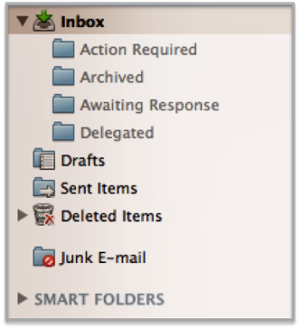 Step 8: Click "Save Changes," and return to a newly organized inbox. Step 1: In the Nav bar, click "Categorize." Step 3: Navigate to the "Organize" tab and select "Arrange By." Then, click "Categories." Step 4: Go back to the "Home" tab. Here are all the categorized emails that we just created. If we want to organize these into separate inboxes as well, we can create folders by right-clicking on "Inbox" and clicking "New Folder." Step 5: Click "Rules" in the navigation bar. Step 6: Click "Edit Rules" and then the "+" button at the bottom of this window. Step 7: Set up rules to automatically filter emails into these folders. For example, when a new email enters my inbox categorized as "Action Required" it will automatically be placed in my "Action Required" folder. 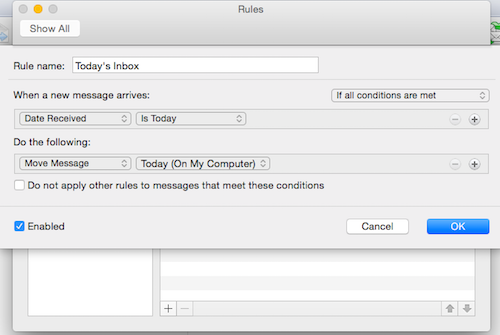 We can automatically act upon our emails by setting up Rules. For example, we can create a rule to delegate a message to our colleague Fred who handles all support issues. Now, any message that I receive from support will automatically be forwarded to Fred and moved to my "Delegated" folder. The Traveler is a hard-working business professional on-the-go. Whether they're unwinding for a week under a palm tree or crossing borders for customer deals, they desperately want to avoid the inevitable swarm of emails they'll receive upon return. Owning multiple carry-on suitcases and being a gold member of a frequent-flyer program ... the traveler is always on-the-go. Whether we travel for work or for pleasure, there's still one thing left: How do we prepare for the stress-inducing, overflowing inbox that we know we'll return to? Regardless of the length of our trip or the reason for our journey, we can utilize the traveler's approach to inbox zero to help manage our email overload. Here's Rebecca Corliss' methodology, and a step-by-step guide on how to set it up. Name of Trip: For emails we receive while we're out of office. High Priority: For urgent or high-priority emails we receive while out of office. Label: Did I receive this while I was away? If we'll be out of the office for an extended period of time, we should create labels to help keep our inbox organized. With labels we can easily distinguish between emails we need to catch up on from our time away and emails we begin receiving upon our return. Filter: Is this relevant to me when I return? These are crucial for staying on top of emails while on the go. 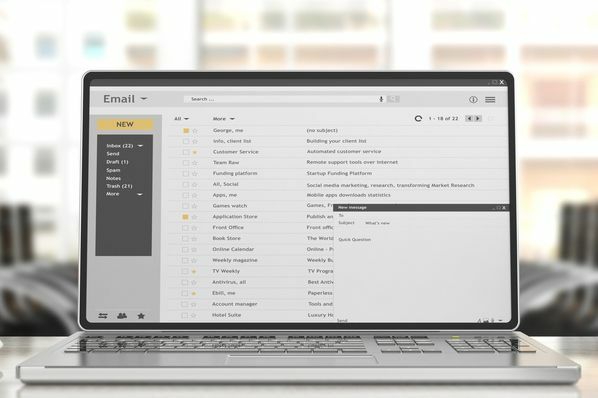 Filters automatically recognize and categorize emails that are high priority, or emails that we don't need to read at all, saving us valuable mental and inbox space. Delete: Is this outdated by the time I read it? There will be loads of irrelevant emails flooding our inbox while we're traveling. We shouldn't bother even glancing at these --- filters will help us delete, delete, delete. When we return, we want to address the most urgent emails first. So, we should make it easier for us to prioritize those emails by using our filters to flag emails sent by managers, executives, or key team stakeholders. Step 2: Set up a filter by clicking the dropdown arrow in the right corner of the search box at the top of our inbox. Create a filter that recognizes any emails being sent to *@company.com. 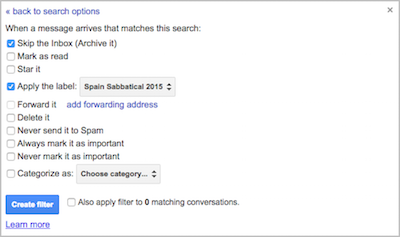 Then click "Create filter with this search" and check "Skip the Inbox (Archive It)" and "Apply the label." For example, Rebecca used *@hubspot.com in order to include all email aliases that she belongs to. These emails will then skip her inbox and be placed in her "Spain Sabbatical 2015" folder. This allows us to avoid neurotically checking our email while we're supposed to be focusing on landing a big client or relaxing on vacation. It also prevents us from feeling anxious when we return to the office to an overflowing inbox. Most people are very reluctant to use the word "URGENT" in the subject lines of emails, regardless of how important they may be, but we don't want people to be afraid to grab our attention for truly urgent matters. So we came up with the Hippo Technique to help identify burning, "need-a-response" items. We should advise our team to use the innocuous "hippo" in the subject line of urgent emails (and if it's super urgent, "emergency hippo") that we should prioritize when we return. Step 3: Add a second filter that deletes irrelevant emails. Everyone receives numerous internal email distribution lists, such as daily or weekly metric updates, which are irrelevant while we're out of the office. These emails are also out-of-date upon our return. To save ourselves time and mental energy later, we should create another filter to delete these updates automatically. Step 4: Return to a "zero inbox." When we return, rested and refreshed, we can release a sigh at the comforting sight of no new mail. Then we should turn off all filters so we start receiving emails as usual. 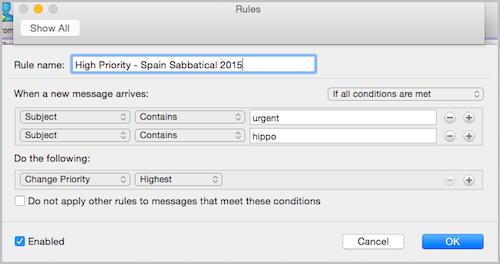 Hop into the inbox folder we created for the trip, in this case, "Spain Sabbatical 2015," and start scanning for any emails with a "hippo" or "important" in the subject line. We can also spotlight search for any emails sent by managers, executives, or key team stakeholders. Once we address the more urgent messages, we can schedule some time in our calendar to respond to the remaining emails in this folder. And that's it. No long, tedious hours of playing email catch up. Just a few filters and a folder, and now we can get back into the swing of work. Step 1: Create a new folder in our Outlook Inbox that's descriptive of the trip or vacation. Step 2: Click "Rules" in the navigation bar. Step 3: Click "Edit Rules" and then the "+" button at the bottom of this window. 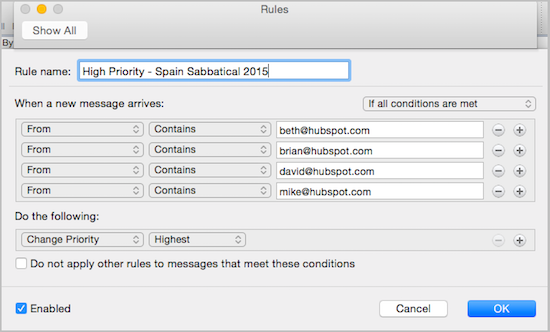 Step 4: Let's name the rule "Spain Sabbatical 2015" and then set the rule to recognize any emails being sent to @company.com. 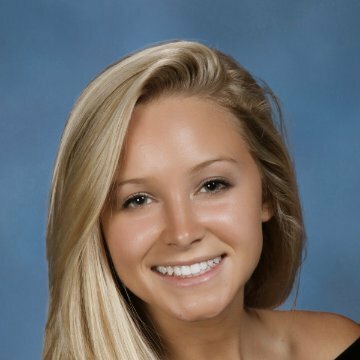 For example, Rebecca used @hubspot.com in order to include all email aliases that she belongs to. These emails will then automatically be moved to her "Spain Sabbatical 2015" inbox folder. Step 5: Add a second filter that deletes irrelevant emails. 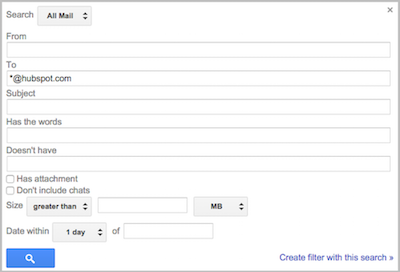 Step 6: Set up another filter for any emails with a "hippo" (see Bonus Tip above) or "important" in the subject line. Step 7: Finally, filter any emails sent by managers, executives, or key team stakeholders. Step 8: Now we can return from our travels to an organized inbox with all of our high-priority emails already top-of-mind. Simply switch "Arrange by:" to "Priority" and they're all there -- waiting for us to sift through as if we hadn't even left. The Executive is always crunched for time. They manage a company or large team. Email is their primary means of communication. They've already attempted inbox zero -- creating multiple inboxes and filters -- but it just doesn't work for them. They need a better strategy. According to Tony Hsieh, CEO of Zappos.com, we must process 10 of yesterday's emails before we're allowed to look at any emails we receive today. Tony calls this process "Yesterbox." By forcing ourselves to process 10 of yesterday's emails before receiving the reward of reading any of today's, we avoid procrastinating on emails that require more focus or effort. Yesterbox is a method to manage emails that creates a "to do" list each day based on yesterday's email inbox. Using this technique, we eliminate the dreadful feeling of besiegement because our focus is on a fixed time period. Emails are streaming in today, of course, but we're only taking action on emails from yesterday. So we actually feel like we're making progress in our inboxes, slowly achieving a day-behind version of inbox zero. Hsieh uses this technique to process and manage his work emails. Yesterbox: For emails we received yesterday. Today: For emails we receive today. Schedule: Have we set aside time for email? Set aside a recurring appointment to sift through yesterday's emails based on how long it usually takes us. For example, it takes Tony Hsieh about three hours to get through his Yesterbox, so he schedules a three-hour meeting at the beginning of each day. If we have another meeting in the morning, we can schedule that time block for later in the day. Calendar: Will this take more than 10 minutes? Any email that requires more than 10 minutes of our time, additional research, etc., should be filed in the "Action Required" folder. Then we should schedule a time on our calendar to complete that action -- almost as if it were an official meeting. On the calendar appointment, we can note the subject line of the email and the folder we filed it in. Or we can use HubSpot Sales email scheduling to send these important emails to ourselves later, when we know we'll have more time to reply. Reward: Have we processed 10 of yesterday's emails? In the "reward" stage of reading our emails (after we've managed 10 emails from yesterday and are allowed to view today's emails) we're only allowed to take three actions: Delete/archive, file, or forward. Only if an email is urgent or pertains to yesterday's email should we respond. Forward: Is this urgent for me to read? For non-urgent emails, such as weekly reading lists, forward those to a personal email address (reminder: We're setting up this process for work emails) and sift through that inbox when you have spare time. Step 1: In Google Calendar, select a date and a time to check email that will work for you on most days. Select the checkbox next to "Repeats" and then set the repeats option to "Every weekday (Monday to Friday)." Click "Done" when it's all set up. 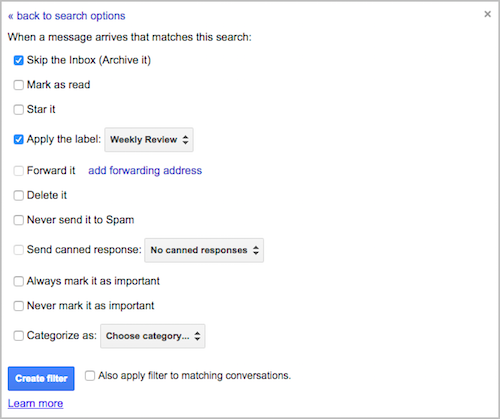 Step 2: Follow steps 1-8 of the Everyday Emailer's approach in order to set up multiple inboxes. We'll be creating the following labels: Yesterbox, Today, Action Required, Awaiting Response, Delegated, and Archived. Step 1: Open your Outlook calendar and click on "New Appointment." Adjust the start and end time to fit a block of time that works best for your schedule. Step 2: Click "Recurrence" and then "Custom." Now set the appointment to recur every weekday from Monday to Friday. Step 3: Go back to the "Home" tab under "Mail." Now let's create folders by right-clicking on "Inbox" and clicking "New Folder." We suggest creating the traditional folders for the inbox zero Yesterbox approach: Yesterbox, Today, Action Required, Archived, Awaiting Response, and Delegated. Step 4: Click "Rules" in the navigation bar. Then, click "Edit Rules" and then the "+" button at the bottom of this window. Step 5: Set up a rule to move all of yesterday's emails to our "Yesterbox" folder. Step 6: And set up yet another rule for today's emails -- to keep yesterday's and today's inbox separated. Step 7: Now we can start achieving inbox zero with Yesterbox! For example, when I see an email in my Yesterbox folder that I can't immediately respond to, I'll move it to my "Action Required" folder. The Entrepreneur is tech savvy, has set up multiple inboxes, and uses shortcuts and labels. As soon as they read an email they make a decision: Delete, archive, reply. They're looking for extra tools and tips that will take their email management to the next level. There are some who already own their inbox. Multiple inboxes, labels, filters, shortcuts -- they have it all down. But, there's always room for improvement. Entrepreneurs typically spend two to three hours in email each day. With email consuming such a large investment of our time, we need a smart process to help us get the biggest return. That's where Brian Balfour's strategy comes in. Weekly review: For emails we don't want to read immediately, but should review by the end of the week. Backlog: For emails that simply aren't a current priority that we should revisit eventually. Then, follow these rules for organizing -- and deleting -- your emails. Mass Unsubscribe: Have we gained value? Adopt a two-strike policy for all newsletters: if we read two articles where we didn't learn anything new, we unsubscribe. We should also unsubscribe from promos and social media updates if we're not gaining value from them. To mass unsubscribe, use Unroll.me. This allows us to more easily maintain a zero inbox because we're not swimming in redundant, unnecessary updates. Move: Does this belong in email? This is key to maintaining an organized inbox. Move anything that isn't pertinent to the world of email. We can save interesting articles to read later with Pocket. Then, we can read it later when we have downtime. We can also put emails that are notes into Evernote. Anything that isn't essential to complete or respond to immediately should be moved to the "Backlog" folder so that we don't forget to get around to it at a later date. Decide: Have we assigned an action to this? No email left unturned. This is the entrepreneur emailer's mantra. Every email we receive should be assigned an action immediately, filed into one of our six folders or scheduled to be reviewed later. Schedule: Is this a time-consuming request or task? Sending emails later helps clear our drafts folder and our to-do list. We can use email tracking to schedule these emails on Gmail. For example, if we receive a time-consuming request, we can use a send later feature so that it arrives in our inbox later that day or the next when we've finished higher priority tasks. Similarly, if we're writing an email at 11 p.m. we can schedule it to be sent in the morning so it appears at the top of our recipient's inbox when they arrive at the office. Batch: Can we limit email as a distraction? To avoid falling into the habit of checking our email 288 times a day, we should limit ourselves to reading and sending emails during fixed periods each day. For example, Balfour limits himself to just two email batching periods. This way, we can focus on higher-priority tasks when we have the most mental energy and save emails for periods of lower mental energy. Step 1: First we need to set up our inbox folders. Go to Gmail "Settings," and click on "Labs." Search for "Multiple Inboxes," and select "Enable." Navigate back to the inbox, scroll down under the "Compose" button to "Create New Label." Now, create labels for each email type. Let's use the categories we just discussed: Weekly Review, Backlog, Action Required, Awaiting Response, Delegated, and Archived. Create the labels we want to appear in our inboxes under the "Multiple Inboxes" tab and click "Save Changes." Step 2: Once we set up multiple inboxes and our primary folders, we can start managing our emails. Let's start by creating filters for weekly emails. All repetitive, metrics-tracking emails should be moved out of our inbox, and into the "Weekly Review" folder. We can set up a filter to do this automatically. Click the arrow within the search bar above the Inbox. Type in the name of the weekly update, i.e. "mixpanel." Step 3: Apply the label "Weekly Review" to this filter and make it skip the inbox, so we don't have to worry about moving it again later. Step 4: Turn on the "Send & Archive" feature. Go to the "General Tab" in "Settings." Scroll down until we find the "Send and Archive" section. Select "Show Send & Archive" button in reply and click "Save Changes." This button automatically archives email after we hit reply. Constantly taking action on our emails -- whether deleting, replying and archiving, or just archiving -- helps keep us at inbox zero. If we're stuck in a lengthy, irrelevant email thread, press "m" to mute it. Any new replies that come to the thread will be automatically archived and we're spared the inbox space. Step 1: First, let's create folders by right-clicking on "Inbox" and clicking "New Folder." Again, we suggest creating the traditional folders for the entrepreneur's inbox zero approach: Weekly Reading, Backlog, Action Required, Archived, Awaiting Response, and Delegated. Step 2: Now click "Rules" in the navigation bar, and "Edit Rules" then the "+" button at the bottom of this window. 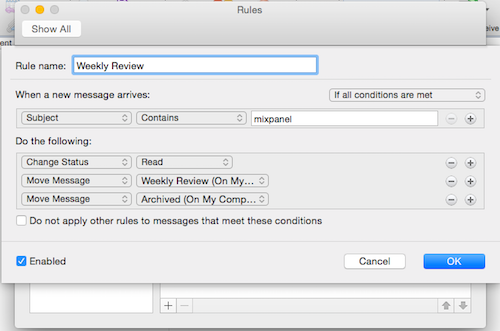 Step 3: Set up a rule to move all of the repetitive metrics emails to our "Weekly Review" folder. Step 4: Set up email templates. Compose a new email, type in the body of the template, and then click "save" in the File tab so it's easy-to-access in the "Drafts" folder. Step 5: Create email batching times. Navigate to "Schedules" under the "Tools" tab. Check the "Enabled" box for "Send & Receive All." Double click "Send & Receive All." 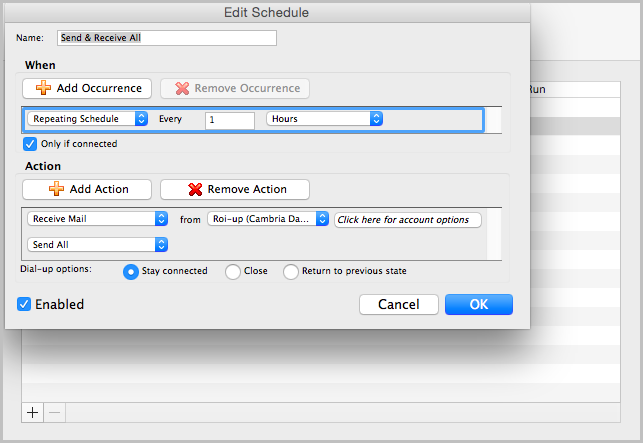 Step 6: Set the occurrence to "Repeating Schedule" however frequently (or infrequently) we'd like to check our emails. Click "Enabled" and "Ok." Now we don't have to stress about checking our emails too often. We're prohibited from checking them as long as we have this schedule enabled. Zip. 0. Nil. Zilch. Nada. We did it. And we never thought zero could feel so good. No matter which approach we ultimately choose, or how we want to say it, we now have all the knowledge and tools we need to get to inbox zero -- no matter what our email style is. To learn more, read our list of canned responses to use in customer service emails next.